AFTER recovering from decades of civil war which ended in 2009 and the devastating Indian Ocean tsunami in 2004, Sri Lanka has emerged tops as the destination for sun-kissed tropical beaches. The relaxed and laidback atmosphere of those beaches has never been more inviting, making beach lovers to just swim, sleep, relax, eat and repeat. Situated on the west coast of Sri Lanka, Bentota is known for its fine stretch of sandy beach, crystalline shallow waters, and water activities such as waterskiing, jet skiing, sailing and windsurfing. 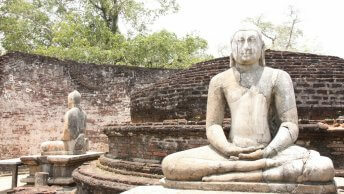 Families love to come to Bentota for its beach, water sports, resorts with Ayurvedic spas and the river safari. Thanks to a lagoon nearby, tourists can go on a river safari along the Bentota River to enjoy mangrove scenery or to spot aquatic birds, lizards or even crocodiles. Best time to visit: End August to mid-October. Just a short drive from the historic town of Galle, Unawatuna is the famous beach in Sri Lanka. Although the beach is not the best place for surfing, its relatively calm blue waters, soft-sloping sand, and magical sunsets draw tourists and sun-seekers. Also, its beautiful coastline is dotted with pastel-colored houses and jewelry and handicraft shops. 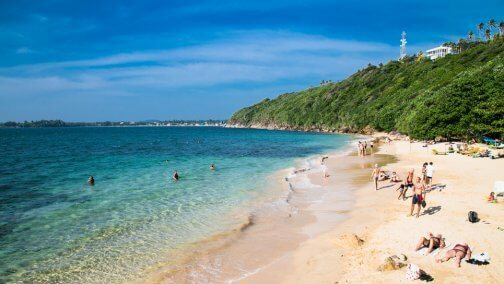 As such, Unawatuna is still considered by many to be the best of beaches in Sri Lanka. Best time to visit: Late August and early September. Located north of Galle and Unawatuna, Hikkaduwa was hit by the tsunami in 2004. But since then, its shores have had a complete makeover with plush hotels and resorts and nightclubs attracting partygoers for a vibrant nightlife scene. Hikkaduwa is energetically transformed during the annual three-day beach festival when international DJs spin music on the beach throughout the night. Hikkaduwa is also suitable for non-partygoers as the beach is a popular place for beginners to take surfing lessons from one of the many schools there. Or tourists can learn about the plight of sea turtles, corals and other aquatic life at the Coral Sanctuary nearby. For those seeking quiet beaches, Tangalle in the south is less visited than the popular beach areas. This fishing village suffered badly from the 2004 tsunami and its rebuilding process had been painstakingly slow. However, in recent years, this haven is seeing luxury beach resorts built along its palm tree-lined shores. Apart from relaxing at the beach, tourists can venture out to fishing villages and rice paddies in the rural areas or visit the Buddhist temples nearby. But the best activity is to watch the sunset at Tangalle’s beaches, for its towering palm trees and seductive sunset colors make for perfect Instagramming! Nestled in a small bay on the south coast with stretches of golden sand and turquoise water, Mirissa is one of the most chilled beach destinations. Far quieter than Unawatuna and more budget-friendly, Mirissa is characterized by modest guesthouses and rustic restaurants. People come to Mirissa to enjoy whale-watching as blue and sperm whales make their migratory journeys around the southern coast of Sri Lanka between December and March. To get the capture the best photos, wade to a nearby rock island and climb the stairs to get a beautiful view of the beach. Best time to visit: December to March for whale-watching and turtle-hatching, or from August to October. The post 5 of Sri Lanka’s most alluring, sun-kissed beaches appeared first on Travel Wire Asia.